Scientists Discover Evidence Of Dog Domestication 33,000 Years Ago! 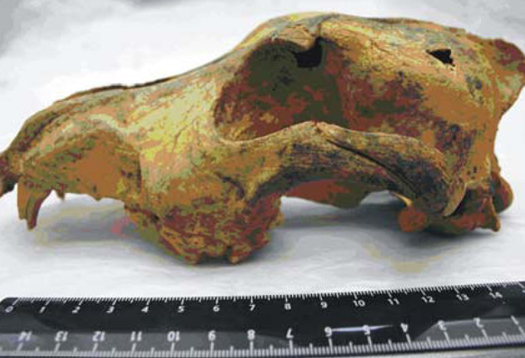 Researchers from the University of Arizona have discovered a 33,000 year old dog skull in the Altai Mountains of Siberia... and it is well preserved... enough to allow the team to determine it was domesticated. The team recently also found a domesticated dog skull in what is now Belgium from the same period of time as the Siberian skull and they write, in the PLoS ONE Journal, that the two findings not only prove that that canines were domesticated that long ago, but that the practice of animal domestication was not unique to one area or one culture. The age of the dog skull was determined by carbon dating and the evidence of domestication was drawn from the shape of the snout and jaws. "Essentially, wolves have long thin snouts and their teeth are not crowded, and domestication results in this shortening of the snout and widening of the jaws and crowding of the teeth," said Greg Hodgins, co-author of the study. Hodgins said that the evidence for domestication is "pretty solid," but that the Siberian dog (Razboinichya canid) who possessed the skull shows no direct relation to later canines. The theory is that continuation of this species was interrupted by the Last Glacial Maximum, which occurred between 26,000 and 19,000 years ago.